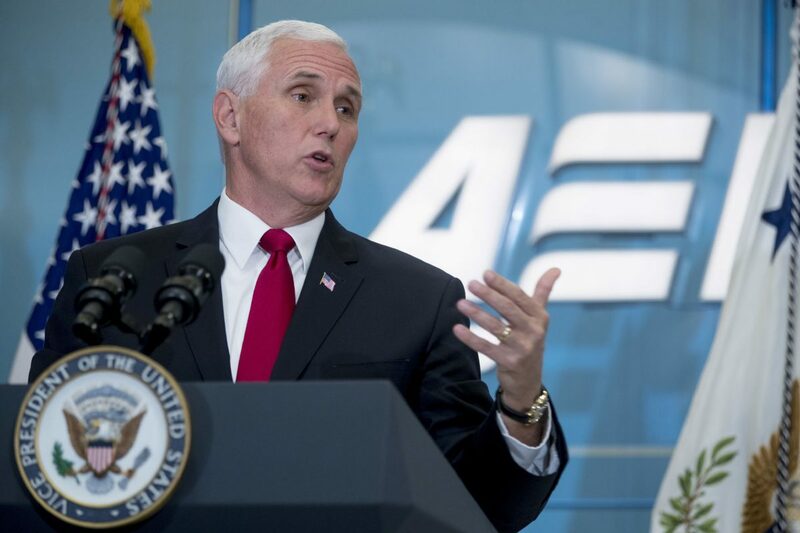 Vice President Mike Pence speaks on tax reform at the American Enterprise Institute, Tuesday, Oct. 24, 2017, in Washington. In all likelihood, President Donald Trump soon will sign into law a measure that will limit the right of American consumers to go to our courts for relief and adjudication when they feel wronged. But we urge the president not to. The measure — which Vice President Mike Pence on Tuesday night cast a tie-breaking vote in the affirmative after the Senate deadlocked — repeals a rule that would allow consumers to band together to sue their banks or credit card companies to resolve financial disputes. In effect, it bars class-action lawsuits, forcing consumers to seek mandatory arbitration in cases involving banks and credit card companies. 2 million Americans claim they were charged fees by Wells Fargo Bank for opening accounts that they had not authorized. And it comes after the credit rating system Equifax admitted to a security breach that has leaked unknown amounts of private information about millions of its customers. But that is exactly what our courts should be allowed to decide: Whether such lawsuits have merit and whether consumer complaints are valid or “frivolous.” This should not be decided by a blanket act of Congress that serves to protect one industry above the needs and rights of U.S. citizens. It’s a system that has worked, Senator, because Americans have had various options to air their grievances in court. And when it failed to work in 2008, it contributed to the Great Recession that our country continues to recover from. Now one significant option — that of class action lawsuits that allow large groups of people to sue companies together — most likely will be taken away. And while it is true that consumers can sue companies on their own, data shows that most do not because of the time and costs involved in individual cases, especially when amounts they are disputing are not very big. But it’s not the amount of a dispute, it’s the principle. If something is illegal or wrong, consumers should have the right to protest it in court, however they choose — individually or together as a group. Mediation, studies show, tends to favor larger corporations, which most financial institutions are. “Once again, we’re helping the powerful against the powerless,” Senate Democratic leader Chuck Schumer of New York said Tuesday night. It “means the courtroom doors will remain closed for groups of people seeking justice and relief when they are wronged by a company,” CFPB Director Richard Cordray, a Democrat appointed by President Barack Obama said after the Senate vote. That would be a travesty.